To increase the effective use of the vehicle required to travel on rough unconstructed roads and trucks, a special arrangement known as four-wheel drive is provided. Due to all four wheels getting driven, the whole weight of the vehicle is available for traction. 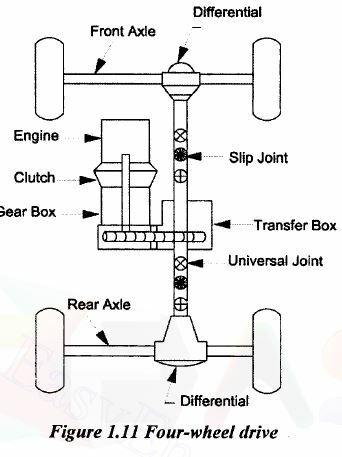 The system is provided in jeeps which are known as 4×4 wheel drive or all-wheel drive vehicles. These vehicles are also called off-road vehicles as it is constructed mainly for the purpose of unformed or off-road driving conditions. Example: Mahindra Scorpio, Maruti Suzuki Gypsy, Tata Safari, Toyota Fortuner, Mitsubishi Pajero, Mahindra Bolero etc. 1. The increased traction is obtainable from four driven wheels which is especially useful on soft or slippery ground. 2. If the front wheel drops into a ditch, they tend to climb out with a rear wheel drive. 1. It increases weight and bulk. 3. It increases fuel consumption. 4. It increases maintenance due to complexity of transmission system. 5. It is possibly difficult to accommodate an anti-locking brake system.